One of the nicer London experiences it's possible to have is happening upon a sign with 'Gallery' and an arrow pointing somewhere on it. You can end up in the strangest places, often places so interesting that the art can take a bit of a back foot to the location. 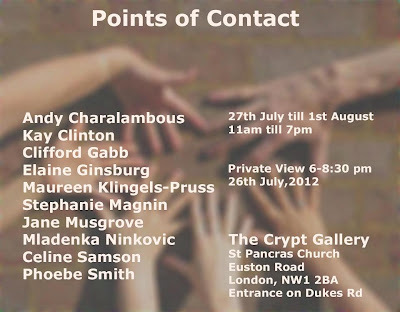 'Points of Contact' is art exhibited in such an atmospheric space that the gallery itself can seem like the most interesting piece of all. This isn't to say that I didn't enjoy the art at 'Points of Contact', more that heading into a dark, old and cobwebby space underground in central London is one of my favourite things. I mean, look at that entrance! Who wouldn't want to head for a look around down there? Hosting art exhibitions in a crypt gives proceedings a rather solemn affair, the air is cool and still, and as it was fairly empty when I attended, it was also very quiet. The walls and floor were unadorned brick, and corridors lead to small, dark and slightly claustrophobic rooms. In a space like this you begin to wonder where all the bodies are, there is the occasional tomb marker here and there, but on the whole the place seems to have been stripped of much mention of its inhabitants. There is a pile of tombstones in the centre, which I assume would have once occupied the walls of the space. Fortunately, the art exhibited within tended to complement the atmosphere of its surroundings rather than be overpowered by it. The artists exhibited here all studied at the Working Men's College in Camden for a Foundation Degree in fine art, presumably they have learnt at the same rate therefore meaning that the art on show has some familial relationship to each other. The pieces might be from a variety of different artists with widely varying things to say, but they all spring from approximately the same source. The work is multi-disciplinary, encompassing sculpture, found objects, paintings and audio-visual work. Among the highlights that I particularly enjoyed was Phoebe Smiths's 'Place of Safety', a halo of crushed eggshells on the floor of the gallery. It's a neat little visual joke that rewards you for 'getting it'. I like the fact that it's laid out in a kind of halo, I suppose if you're exhibiting under a church then it feels quite appropriate. It made me wonder if the church puts any restrictions on what can be shown in its gallery or not. The sometimes uneasy relationship between religion and art could neatly be described as walking on eggshells - and visitors to the gallery literally get to do that here. As we are directly underneath the church, the congregation walking above also gets to do it, albeit unwittingly. Another piece I liked was Jane Musgrove's 'The Timbre of Your Voice' a collection of books sealed in wax. They belonged to the artist's father, who took possession of them after he died. The books were in another language, and unreadable to the artist so they've were sealed in wax. It's a quite striking effect, effectively freezing the text written inside them. This, like the eggshells above is nicely tactile - we're invited to pick up and handle them. I generally enjoy art like this that seeks to stimulate more senses than just sight. Here, being able to hold the book seems to create a paradox - if I really wanted to it would have been possible for me to crack the wax shell open, but the text within themselves would still have been impenetrable to me. The only really valid way for me to interact with them is as objects, and them being sealed in wax underlines that fact. Walking further down the corridors of the crypt we come to Andy Charalambous' ultraviolet starburst creation. This is accessible from a two different places in the gallery, one close to the epicentre of the 'burst', and one at the outer ends of it. Both are interesting viewpoints, although I preferred getting up closer to the centre. The taut strings that compromise the bursts of light look like laser beams from a distance, and it is only upon getting closer that you notice them gently swaying in the light breeze. This is a piece that can only work properly in a lightless area - without the ultraviolet glow it would be pretty dull. Even in the dark of the crypt some light intrudes upon it at the far end, ever so slightly spoiling the effect. Even so, the scale of the piece is great, and as an effort to physically capture the action of light in motion in a static object it succeeds. 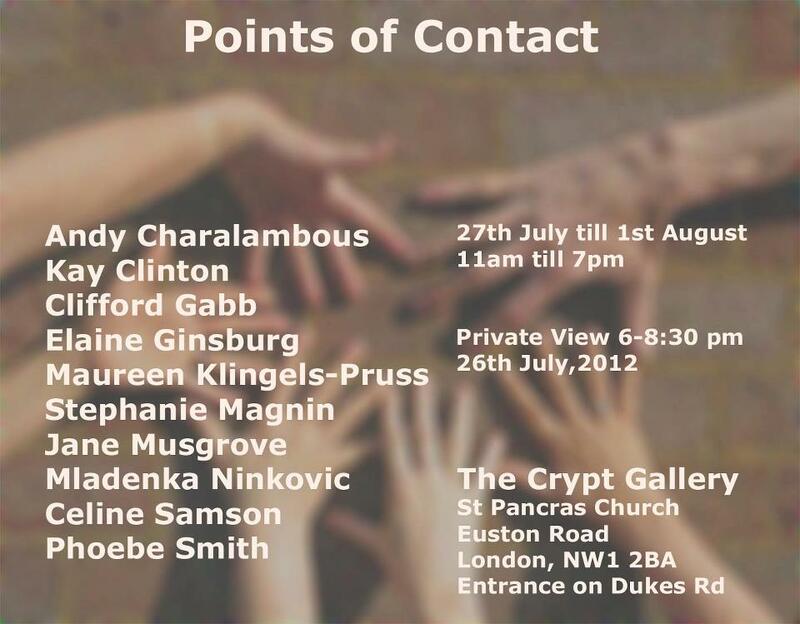 In this exhibition, more than many I've seen in London lately, the art seems to live or die by how well it fit into the aesthetic of the crypt. I'm not sure I would have enjoyed Celine Samson's piece, 'The Ghost Diner' (the white, plaster pieces in the picture above) if they didn't bring to mind a row of gravestones and complement the slightly morbid surroundings. Having a space like this to display in allows you to be dramatic with your lighting, the artist has almost complete control of how things look without having to be concerned with daylight or street light pollution. The whiteness of the material above gets picked out by the light, looking clean and fresh against the grimy Victorian walls of the crypt. It serves them well - in a modern gallery where the walls are invariably pure white they would run the risk of 'melting' into the background. Jane Musgrove's collection of hanging feet - 'Still' - are another example of the location complementing the art. The positioning of these casts of feet, using clingfilm and sticky tape injects an element of humanity into a place notable by its absence of representations of people. There were numerous casts hanging in front of the one pictured above, but this one in particular stood out due to its position. We can presume that directly below them are a collection mouldering Victorian skeletons, the last physical remnants of individuals, so it seems fitting that surrounding them are the physical impressions that the artist has left of herself. Whereas in that stone box are the inner framework of what's left of people long passed, the art surrounding it shows the outer impression of someone that's still alive. Maybe as a juxtaposition it's a little on the nose, but it's still pretty neat and manages to make a point while showing some reverence for the dead whose homes the artists have temporarily occupied. There were a few pieces that I don't think worked particularly well down here. The majority of the two dimensional paintings and photographs were overpowered by the architecture they were placed in. Aside from that, some of the subject matter and form seemed at odds with the sepulchral atmosphere, especially Andy Charambolous' photographs representing physical representations of Feynmann diagrams. 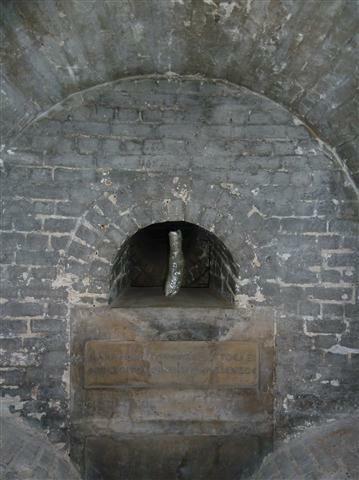 While a very neat idea, and well executed, theoretical science just didn't seem to work in the context of a crypt. I'm all for an exploration of the conflict between hard science and contemplative mysticism, but in this location it's an all or nothing proposition - you either devote the entire place to it or don't. It's for this same reason that I didn't think Maureen Klingels-Pruss' sculpture pictured above worked - despite being a beautiful and finely executed object - here it tends to meld with the walls of the crypt and the hard, cold, clinical lines are too much at odds with its dirty, dusty, mildewy surroundings. For something randomly wandered into from off the street this was a very nice exhibition, and upon writing this article I wished I had taken more photos. I very much enjoyed the blocks of soap, the book of buttons and the 'lightbox' off in one of the rooms, but unfortunately forgot to photograph them. What this exhibition underlined for me is the importance of making sure art is complemented by the space its placed into and vice versa. St Pancras' church crypt has such a unique atmosphere that it becomes almost immediately apparent when a piece seems is working against it. I'm sure that my opinion of much of the art I didn't think so highly of would be changed having seen them in a more sterile gallery environment, or that some of the things I very much enjoyed were largely because of where they were, not what they were. Edit: Thanks to Celine Samson for updating me as to the names of the pieces and the artists that made them.